This page introduces how a novice can create attractive flyers immediately. Use Edraw flyer design software which offers abundant built-in vector symbols and free template to create fashionable and effective flyers. Flyer, also called "leaflet", is a form of paper advertisement intended for wide distribution and typically posted or distributed in a public place, handed out to individuals or sent through the mail. A well-designed flyer can be used for various purposes, such as advertising an event, promoting a goods-selling business and recruiting members for organizations or companies, etc. In this case, how to create a flyer of high-quality is of great importance. This article instructs you to create an effective flyer with Edraw flyer software. Before starting flyer design, I recommend you some tips to make wonderful flyers. To get a fashionable and effective flier design, bear the following points in mind. Figure out your purpose and target audience, then collect relevant information for prepartion. Post easy-to-read contents that the audience can understand easily. Be conscious of color assortment. Make sure the layout is clean and concise. Before printing, show it to others and ask for opinions. The following are six steps on how to create fancy flyers using Edraw flyer software. If you are a flyer producer, you need detailed information on products and services, features, selling points and corresponding operations, etc. In addition, high-quality illustrations, images and pictures that match the theme need to be prepared in advance. Getting the information and other elements well organized is the precondition of making an effective flyer. Navigate Edraw Infographic software, click on " New", open a library containing graphics necessary for flyer design, then choose a pre-made flyer template or the blank canvas. The size of the flyer is not fixed, but A4 and A5 are common formats. 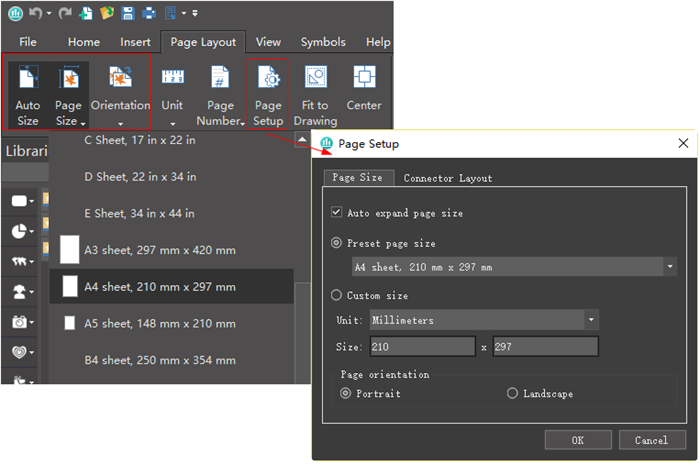 On Page Layout tab, set the size and proportion of the flyer with "Auto Size", "Page Size"and "Orientation" button. You can choose various default size or custom size by clicking "Page Setup" button. 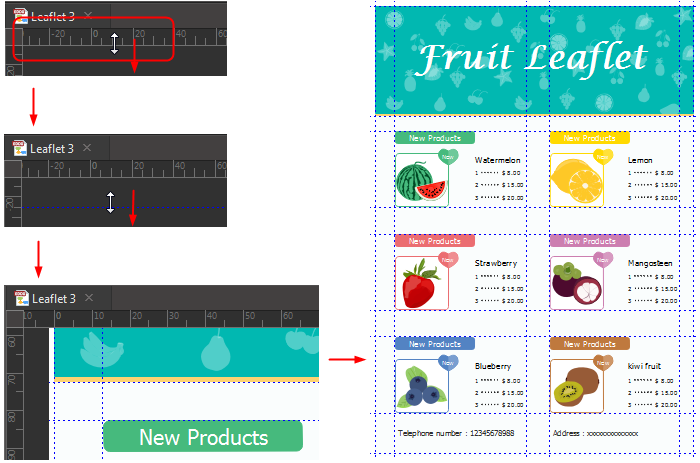 Set the layout of your flyer and measure the size by using rulers, gridlines and guidelines. You need to drag the layout gridlines to set the margins of the page or divide the page into sections for accurate placement of texts and images. Have a blueprint of the flyer in your mind - how to arrange various elements such as headings, body texts, and graphics in the flyer. Place guidelines: Drag rulers from horizontal and vertical margins to create corresponding guidlines. Move guidelines: Click on the guideline and it will turn green, and move it to your desired place by grag-and-drop operation. Note: You can choose whether or not to display rulers, guidelines and gridlines by clicking "Show / Hide" on "View" tab. 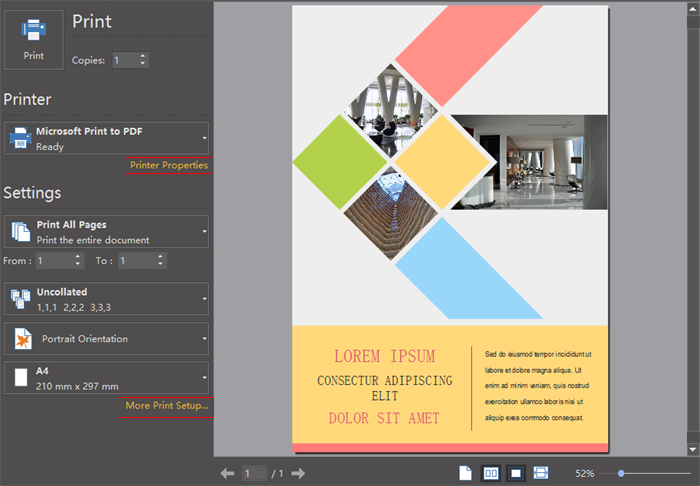 Input your content in the text block..
Customize the attributes of your text in "Font" panel from the sidebar. Edraw Infographic provides users with a great number of vector clip arts that cover almost all industries to choose from. Drag and drop the one you favors from the clipart library to enrich your flyer design. 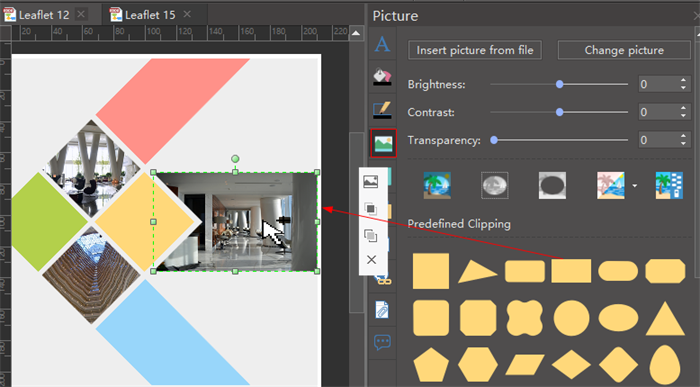 Open the libraries of clip arts from the left of the UI. 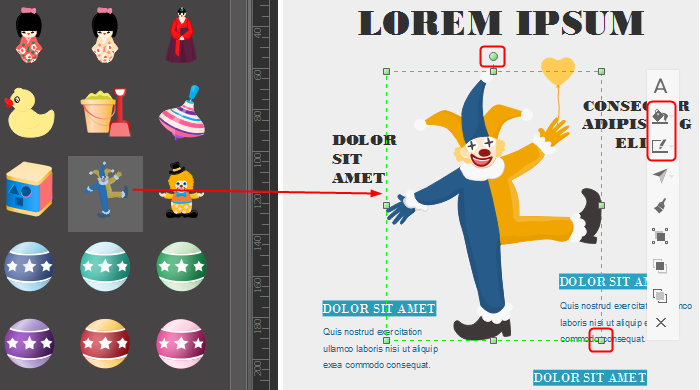 Choose the clip arts and shapes you need and drag-and-drop them to the canvas. 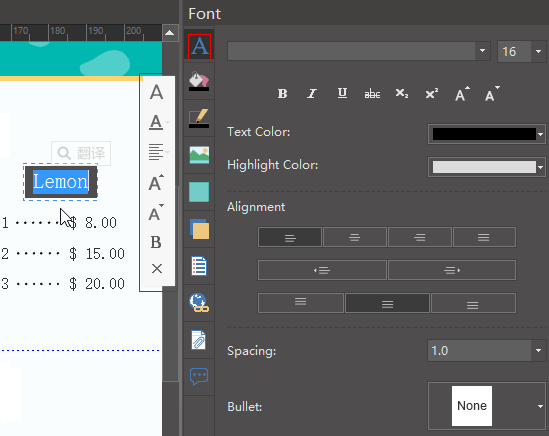 Customize the elements you have chosen instantly with the following operations: rotate, fill, size, align style and layer etc. On "Picture" panel of the right sidebar, click "Insert picture from file" and choose an image from local files. Crop the image into the shape you prefer and beautify it with tools on "Picture" panel. 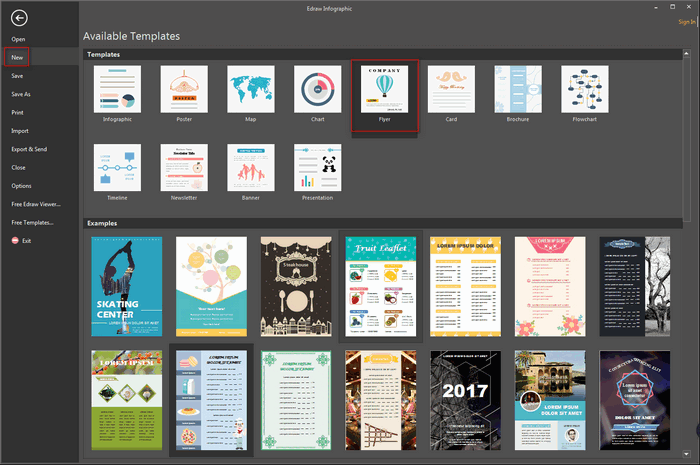 When you've finished the design of your flyer, you can export and save it to various formats such as JPG, PDF, office file, SVG, Visio. Edraw flyer software supports cloud storage and collaboration. You can access your design and collaborate with partners whenever and wherever you need. 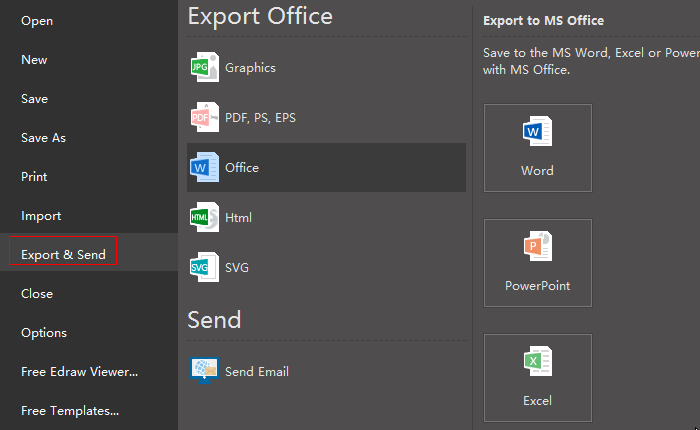 Go to "File" tab and choose "Print" or click "Print" button on the quick access bar, you can see the print preview in the print setup interface. You can check all the pages with the arrow on the page under the preview. If the flyer is larger than the printing sheet, it will be printed on more than one piece. If you want to see the overall effect on one sheet, click "More Print Setup" and choose"Fit to 1 Sheet". Now, I guess you can't wait to create a flyer with Edraw flyer software. Get a free trial! 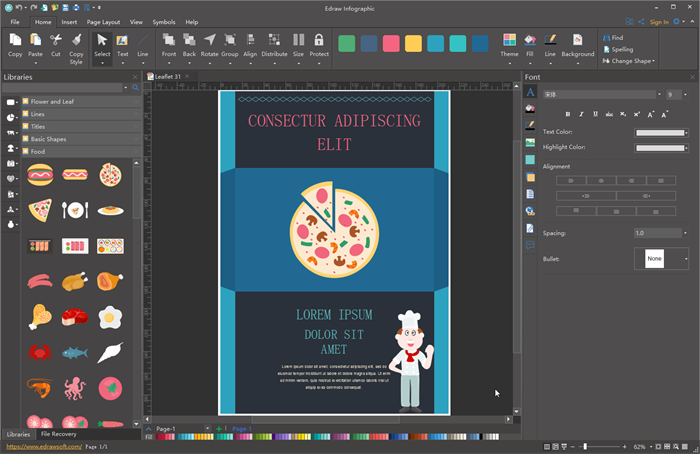 Download Flyer Maker and Use 10,000+ Elements! Want to use the elements above in your flyers? Download Edraw flyer Maker! It includes a large variety of pre-made shapes which are easy to modify. Design a wonderful flyer is just a few click away. Try it now!